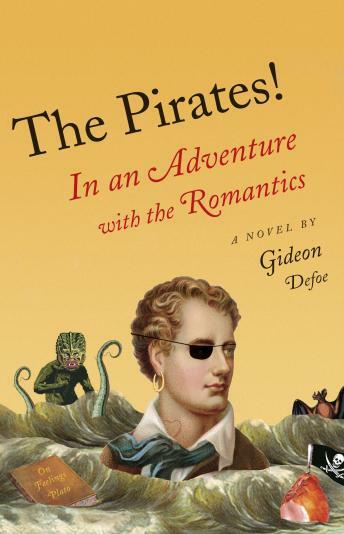 In Gideon Defoe’s fifth Pirates! adventure, the dashing Pirate Captain and his intrepid crew encounter perhaps the most swashbuckling poets in history: Lord Byron, Percy Bysshe Shelley, and Shelley’s fiancée, Mary Godwin. While visiting the shores of Lake Geneva to restore their spirits and their finances, the Pirate Captain and his crew encounter some surprising fellow adventurers, literary giants of their age: the swaggering Lord Byron, the oddly shifty Percy Shelley, and his smart, quite attractive fiancée, Mary. Together the poets and pirates embark upon a journey that leads from the curiously adventureless Switzerland into the darkest bowels of Oxford, and finally to the forbidding heart of eastern Europe. Amidst haunted castles and early feminism, the Pirate Captain will confront some important questions, namely: What is the secret behind his mysterious belly tattoo? Is “Zombuloid, the corpse-beast” a better name for a monster than “Gorgo: Half-man, half-seaweed?” And, most importantly, what happens when a pirate finally falls in love?